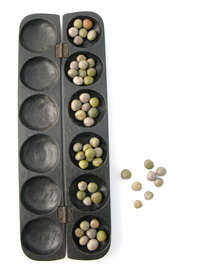 Originating in Africa, oware is the oldest board game still played all around the world today. Giving hours of fun, this game then stores away into its own beautifullly carved box. Comes with instructions. Size 46cm long x 16cm wide when open.